HOOFDDORP (Neth.) - Corendon Kinheim on Saturday won 6-1 vs. Konica Minolta Pioniers to even the best-of-five Holland Series at 1-1. Game Three will be played on Sunday in Haarlem (starting at 1:00 PM). Game Four follows next Saturday at Hoofddorp. Today's game was a complete opposite of Thursday's match-up. In the opener, Pioniers dominated, today it was Kinheim. On Thursday, Pioniers made the defensive plays, today the Kinheim-defensive played outstanding. On Thursday, Pioniers hit on the right moment, today Kinheim did the same. It underscored that both teams are very equal, despite the fact that Kinheim won the 6-game series against Pioniers in the regular season. Lefthander Patrick Beljaards went the distance for Kinheim. He struckout four batters and gave up nine basehits, including four by catcher Mark Duursma, who is now 7-for-10 in the Series. The lower part of the Pioniers batting order was not productive. Before the ninth inning started, the last five batters were 0-for-15 (including a sac-fly), before two batters singled. After the ninth, they were only 2-for-20. When the fourth batter is included, the last six hitters went only 3-for-24. The top three hitters in the Pionier-order were 6-for-12, including one basehit by Norbert Lokhorst, who normally hits in the number nine position. But today, he was moved up to the number two slot, while regular second hitter Mark Duursma was put in third place. There, he replaced Glenn Romney, who was absent today, as he was attending the wedding of his sister. The batting order of Kinheim was more balanced today. Their top four hitters were 6-for-16, while the lower five also was productive, going 7-for-19. In the second inning, it appeared to go Pioniers' way again. Tjerk Smeets led off with a single, but then Edward Illidge again grounded into a double play. Last Thursday, he grounded into a double play twice. A grounder ended the inning. But in the third inning, Kinheim took a decisive lead scoring five runs off starter Richard Orman. The lefthander threw two strong games in the Play-Offs against DOOR Neptunus, which he both won. The last game meant the elimination and dethroning of Neptunus and Series-clincher for Pioniers. Today, the veteran pitcher was hit hard in the third at bat, giving up six hits and five runs. Vince Rooi led off with a double down the leftfield foul-line, then advanced on a sac-bunt by Wouter Heemskerk. Rooi then scored the opening run on a single by Denny Beljaards. Next, a bunt by Danny Rombley ended in a throwing error by catcher Mark Duursma and brought runners on second and third base. Beljaards and Rombley both scored when René Cremer followed with a triple to deep leftfield. The inning wasn't over yet, as Dirk van 't Klooster followed with an RBI-single to make it 4-0. Van 't Klooster then moved on a single by Tjerk Smeets and scored on a 2-out single by Roel Koolen, before a flyout finally ended the inning. After Kinheim stranded two runners in the top of the fourth inning, Pioniers came close to a run in the home fourth. Mark Duursma led off with an infield-hit, just out of reach of third baseman Wouter Heemskerk, and advanced when short stop René Cremer made a throwing error. After Dè Flanegin lined out to Cremer, Duursma advanced on a comeback-grounder by Glennsig Polonius. But the inning then ended when centerfielder Danny Rombley made a great diving catch on a live drive by Edwin de Graaf. Kinheim left two more runners behind in the fifth inning, but then added a run in the sixth. Denny Beljaards led off with a walk and Danny Rombley singled, which marked the end for Richard Orman. He was relieved by Daan de Jong, who loaded the bases by walking René Cremer. Dirk van 't Klooster followed with a sac-fly to centerfield to score Beljaards, but when the throw went towards third base, Cremer opted to go to second base, but was thrown out there to complete a double play. A flyout by Tjerk Smeets ended the inning. In the home sixth, Pioniers scored its lone run. With one out, Norbert Lokhorst reached on a bunt-single, then moved on the third single in the game by Mark Duursma and a single by Dè Flanegin. He scored on a sac-fly by Glennsig Polonius, but Pioniers left two runners behind when Edwin de Graaf grounded out. Pioniers turned its third double play (and seventh in two games) in the seventh inning in which Kinheim left two more runners. 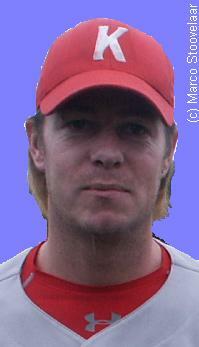 The Haarlem-team then didn't reached base anymore, as Daan de Jong retired the last seven batters in a row. In the home ninth, Marcel Venema singled with two outs, then pinch-hitter Jaïr Roseburg also singled, which brought Pitching Coach Eelco Jansen out of the dug-out to talk to Patrick Beljaards. Moments later, the game ended when Jefferson Muzo (who filled in in centerfield for Glenn Romney) grounded out.